Over time I've grown to better appreciate the Netflix Voltron reboot series given it's many familiar aspects but also surprising narrative divergences. But I guess some of the best parts of the show involve old story concepts from the original show presented in surprising new ways that end up truly elevating the narrative. And I think we got to see some of that in this season of Voltron: Legendary Defender more than any other. I'm still annoyed at the largely piecemeal fashion that the show had been released but it was driven by an honest desire to release Voltron content sooner rather than later. This season is pretty much the last of the half seasons that have resulted in pretty staggered storytelling before the big push to the end of the show as a whole. 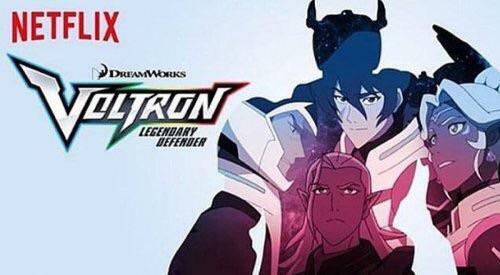 Synopsis: Voltron: Legendary Defender is an American animated television series produced by DreamWorks Animation Television and World Events Production for Netflix. The show will conclude with an eighth season of 13 episodes come December 2018. During the fifth season we saw the rise of Prince Lotor (A.J. Locascio) to become the new leader of the Golra Empire, although his rise to power hasn't been one without conflict and resistance. And this is best demonstrated by the likes of Sendak (Jake Eberle) and his splinter group of Galra known as The Fire of Purification actively campaign against Lotor and try to rally support for his ouster as their ruler. Meanwhile the Voltron Team has their own share of troubles as they try to help Lotor bring the Golra Empire to heel. Shiro (Josh Keaton) appears to be having unusual visions more frequently and the implications are a little disturbing. Keith (Steven Yueh) learns the truth about his mysterious mother. And Allura's (Kimberly Brooks) new alchemic abilities may be more important than the team had realized. What I Liked: The evolving mythos of this series has been quite the fascinating one and something that has been largely divergent from the original cartoons. Given the climax of the fifth season, this venture found a way to dive even deeper into the lore of things and we got to learn a lot of surprising new things about their reality and more and more it's evident how things will come together for the end game. And I rather appreciated the many twists and turns around Prince Lotor. We had all sort of expecting him to be as evil as his original series incarnation and this season certainly touched on his darker side more than some of the prior ones had. But at the same time there was still that narrative twist that doesn't quite paint him as entirely evil and the Voltron Team really need to consider where they stand with him and his plans for the Galra Empire. How they resolve this conflict is really want defines this season. What Could Have Been Better: Totally had mixed feelings about the filler episode "Monsters & Mana" which depicted the team playing some sort of a tabletop RPG. As much as I enjoyed the quirkiness of the episode, it felt again like an odd investment of episode time given the highly limited run of the season. And given how things ended, it's not like this episode gave us new insights that could have better explained the final twist. And then there's the odd bit of how long Team Voltron continued to work with Lotor without honestly investigating him a it more or better understanding his obsession with Quintessence and how it could be used. But I guess since they had gone this far down the rabbit hole and restored Lotor to power there was no real turning back or something. TL;DR: Voltron: Legendary Defender make sure to remind you that things are approaching end game given the tone of this season and all the struggles they have to surpass. But you can also feel that the ultimate payoff at the end of the show's run has a lot of potential to be quite awesome, and thus we soldier on. The sixth season of the show gets a good 4 unexpected flashbacks and time jumps out of a possible 5.